Dubai, United Arab Emirates —January 9th, 2019: Huawei, the iconic global tech brand, consolidated its position as an international leader in tech innovation by retaining its position as the world’s second largest smartphone vendor in Q3, according to data from the International Data Corporation (IDC) Worldwide Quarterly Mobile Phone Tracker. Leading the innovation space in the smartphone industry, Huawei is ranked the 5th biggest spender in R&D globally according to “2018 EU Industrial R&D Investment Scoreboard” report by JRC EU Science Hub. Consumers in the MEA region have embraced Huawei’s devices that embed innovation into their DNA and are designed to incorporate future technologies operating within a highly secure and stable ecosystem. With 17 R&D centers, 36 joint innovation centers and 45 training centers around the world, Huawei’s commitment to R&D has enabled it to emerge as a leader that prioritizes safety and security of its users and introduce In-Device Artificial Intelligence chipsets in the industry. With the growing demand and presence of AI technology cutting across various sectors, AI-powered devices are increasingly dominating the tech landscape as they promise faster response times, efficient operations and unparalleled visual results. To this end, Huawei introduced in 2018 the Kirin 980, the first 7nm mobile AI chip, through the launch of the HUAWEI Mate 20 Pro, which is the ultimate engine to power next-generation productivity and entertainment applications designed to bring cutting-edge raw performance to consumers. 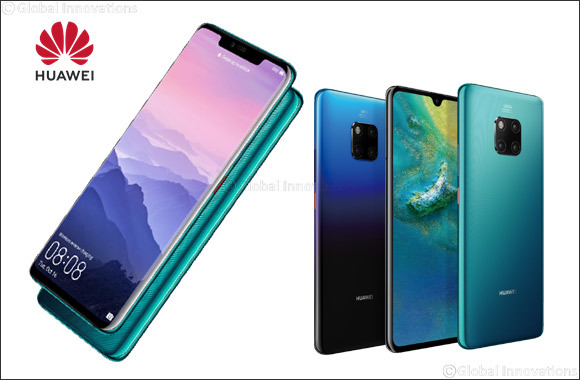 In 2018 with the launch of its flagship smartphone, the HUAWEI Mate 20 Pro, Huawei has enjoyed incredible success since the phone was sold out during its pre-order stage before it even hit the shelves, and The HUAWEI Mate 20 series also sold ten times more than its predecessor (the Huawei Mate 10 series) in the UAE. Thanks to its extraordinary new features such as the revolutionary matrix camera system with the world's first ultra-wide angle Leica triple camera, 2.5 cm Leica macro shots, a long-lasting battery and the trailblazing reverse charging feature. The HUAWEI Mate 20 Pro also pioneered a new era of AI powered smartphone cinematography with its unique AI Portrait Color video mode. Huawei is the fastest growing smartphone brand in the MEA region. Furthermore, according to the Growth from Knowledge (GFK) August 2018 report, Huawei CBG’s market share in the region was 21.5% - cementing its position as the second smartphone vendor in the Middle East and Africa region. Huawei ranks 79 globally in the Forbes Most Valuable Brands in the World list, representing innovation, leadership and success from China. With its pioneering technology, delivering On-Device Artificial Intelligence, Huawei CBG is shaping the future of smartphones as intelligent tools that understand users and help them develop more meaningful ways to stay connected. Its game-changing technology offers an advanced and powerful system designed to deliver unparalleled next-generation smartphone innovation for the consumers of today and allows them to fully immerse themselves in today’s dynamic digital world. Through its heavy investments and commitment to innovation, Huawei has shifted from smartphones to the intelligent phones by developing components and technologies that power AI computing and offer a significantly faster intelligent experience within a highly secure and stable ecosystem for consumers in the region.